This year on Black Friday, Oakland Mall is encouraging customers and employees to pull out their most outrageous Christmas sweaters and celebrate the retail holiday by wearing them to shop in style. Throughout the day Oakland Mall will reward the festive shoppers with a FREE Oakland Mall tumbler and coupon for a FREE soft drink to refresh themselves during the busy shopping day. 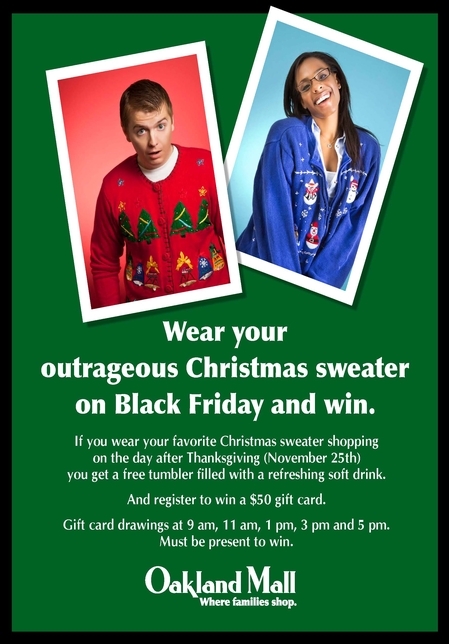 Shoppers sporting the traditional fashion icons will also be eligible to win a $50 gift card to the mall. Drawings for the gift cards will be at 9am, 11am, 1pm, 3pm, and 5pm and the lucky fashionistas must be present to win. Oakland Mall will open at 6am on Black Friday and will have other gifts and fun for shoppers throughout the day including Mystery Bags for early morning shoppers, Facebook fan gift card giveaways, and “Minute to Win It” games with 96.3 WDVD. Oakland Mall is located on the northwest corner of John R and 14 Mile Road and is open from 6 am – 10pm on Black Friday. Normal business hours are Monday through Saturday and 11 am – 6 pm on Sunday. Visit http://www.oaklandmall.com/ for more information, schedules, and holiday hours.